A flurry of turbine purchase agreements (TPAs) from around the world meant Vestas' global order intake for 2018 surpassed 12GW, the manufacturer claimed. The company announced more than 2.3GW of orders between 19 December and 1 January for projects in the US, China, Australia and several other markets. In doing so, the manufacturer also surpassed its record order intake of 11,176MW last year. A third undisclosed customer in the US for 202MW of its turbines. 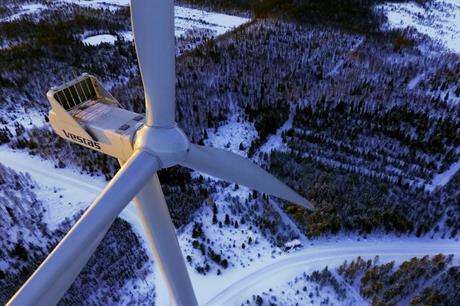 Vestas will provide 56 of its V136-3.45MW turbines delivered in 3.6MW Power Optimised Mode. The turbines' 112-metre high towers and tip heights of 180 metres will make them the tallest in the country, the manufacturer claimed. MidAmerican Energy also confirmed an order for 61 of Vestas’ V110-2.0MW turbines (combined capacity of 122MW) for the 2GW Wind XI project in Iowa 122MW. Delivery is expected to begin in third quarter of 2019 and commissioning to follow in the fourth quarter. Phoenix Wind Repower for 359MW of its V110-2.2MW turbines at the Trinity Hills (225MW), Sherbino Mesa II (150MW) and Silver Star (60MW) wind farms, replacing the existing Clipper turbines. Repowering will boost the projects’ combined capacity by 24MW, according to Windpower Intelligence, the research and data division of Windpower Monthly. DTEK Renewables for 99MW of turbines from its 4MW platform delivered in 3.8MW mode for the Orlovka wind farm in Ukraine. The project will be built in the Zaphorizhia region in the south of the country. The joint venture of Russian technology giant Rusnano and Finnish developer Fortum for the 198MW Kamensko-Krasnosulinsky project. The wind farm will be located in the Rostov region in the south-west of the country and will comprise 52 V126-5.45MW turbines delivered in 3.8MW Power Optimised Mode. An undisclosed developer for 30 V126-3.45MW turbines to be installed at Sri Lanka’s first large-scale wind farm. PGE for 88MW across two projects the Polish state utility was awarded in the country’s renewable energy auction in November. Italian developer Sardeolica for a 32MW expansion of the 96MW Ulassai wind farm in Sardinia. Vestas will add nine V117-3.45MW turbines delivered in 3.6MW Power Optimised Mode. To accommodate the site’s specific wind conditions and maximise energy production, six of the new turbines will have a hub heights of 91.5 metres and the other three will have hub heights of 116.5 metres. Bright Energy Investments, a joint venture of Western Australian electricity generator and retailer Synergy, global infrastructure investment fund DIF and Australian industry superannuation fund CBUS for the 184MW Warradarge wind farm in mid-Western Australia. Brazilian developer Casa dos Ventos for the 151MW Folha Larga site in the country’s northeastern state of Bahia. Vestas will supply 36 of its V150-4.2MW turbines and manufacture components locally to comply with the Brazilian Development Bank’s (BNDES’) Finame II rules. The regulations require local content to account for 70% of hub, nacelle, tower and blade manufacturing. Delivery is planned for first quarter of 2020 and commissioning by the end of the second quarter of the same year.